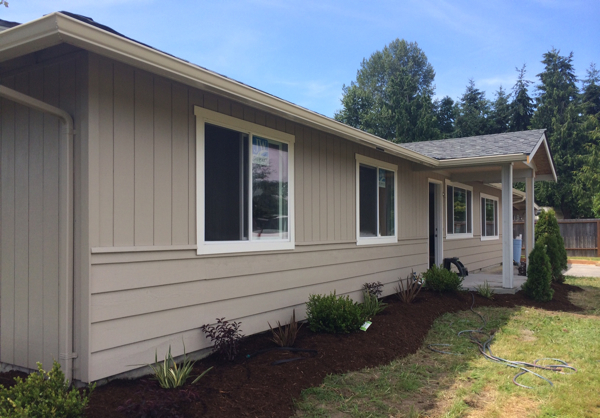 Sequim homes are selling, and the inventory is not being replenished fast enough to replace the ones sold. Builders have not had the financial incentive to build homes for seven years. But there are some new listings coming on the market, like this home, which is only 4 miles from downtown Sequim, on a dead end street in a quiet neighborhood, and sits on a fully fenced acre. This home is right in the Blue Hole, which means this location gets only 16 inches of rain each year, one-third of Seattle’s. This 1,400 square foot, 3 bedroom, 2 bath home all on one level is currently being remodeled. That includes hardwood floors, an entirely new kitchen, new bathrooms, new windows, a new roof, and the list goes on. It’s hard to find a home on one acre, and all of this acre is useable. Want to have your own little orchard? This would be perfect. Want to raise some sheep or goats and chickens? Maybe you just want to have your own organic vegetable garden. Almost too good to be true, isn’t it? This home hasn’t been priced yet, but will probably be listed in the neighborhood of $245,000. Watch Sequim4Sale.com to keep up on new listings like this one, because the best homes in the best areas at the best prices are selling quickly.